You post is really great.i love to read books and novel. Thanks. I hope you can join us for Spark Week. Thanks for getting on board Lyn -- and nice choice! I thought I'd choose something completely different! Thanks, Lyn! And I agree with Harriet - great choice; I didn't even know Spark had written a book about Emily Bronte! I will put it on my agenda and think I will read again The prime of miss Jean Brodie. Have you the beautiful Folio edition? Marie-Josee, I have a Penguin edition of Miss Brodie which I read many years ago. I may have time for a reread as all MS's books are quite short. I don't have any Folios of her books but I'm sure they're beautiful editions. I just read the Wikipedia's article about Muriel Spark : interesting indeed! I look forward for the posts in april! Even though I work full-time, I'm lucky that I do have time for reading in the evenings & at weekends. If I have a busy, social weekend (doesn't happen often, I admit), I feel quite deprived of my reading time. 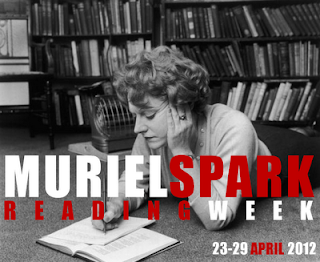 Muriel Spark was an interesting writer & I'm looking forward to all the posts during MSRW.